Podiatry is perhaps one of the few medical fields that are widely misunderstood by general public. Some think podiatrists only treat minor foot problems like ingrown nails or calluses. Others consider podiatrists to be solely for diabetic patients. This article will shed light on top 10 foot problems that podiatrists treat. You might be surprised to learn how many various foot diseases and conditions modern day podiatrists can successfully cure. In fact, a podiatrist is a specialist who devotes his career to diagnose and treat any disease, disorder or acquired conditions of the feet, legs and ankles. If you take into consideration how much we depend on the use of our feet daily, this makes for one important specialist for kids, adults and seniors. 1. Foot related birth defects. Clubfoot is one of the most severe types of congenital abnormalities of the feet due to a variety of reasons, including growth problems and positioning in the womb. Depending on the severity of the condition your child will need special treatment and is usually diagnosed at birth or even during a prenatal ultrasound on some cases. An infant affected by clubfoot condition will have abnormal positioning of the feet, ankles or knees that appear facing inwards. It is important find a qualified podiatrist who will start treating your baby with manipulations and casts from the first days of his life to insure proper feet development and eliminating major foot pain later in life. 2. Developmental abnormalities. Some foot problems could not be diagnosed as congenital abnormalities at birth but rather developmental problems that occur later, usually during the first year in a child’s life like toe walking, flat feet, pigeon toes and bow legs. Some of these conditions require serious tests, physical therapy, special footwear selection and even surgery in some cases. 3. Diabetic Feet usually occur in patients affected by diabetes, a serious health condition when a person’s body does not produce enough insulin that helps process sugars resulting in high levels of sugar being present in a patient’s blood stream. Very often diabetic patients may develop hard to heal sores on their feet that might require surgery and in extreme cases amputations. To prevent these extreme situations, it’s important to seek a podiatrist in your area if you have diabetes. Your podiatrist will give instructions how to manage foot problems that are common with diabetes, how to find proper foot wear and what to watch out for. 4. Injuries of the feet and lower legs are very common for professional athletes. Some podiatrists specialize in foot problems that require surgery to improve the conditions of athletes and people involved in active lifestyles. Podiatrists are qualified to perform surgery and prescribe appropriate treatment including orthotics like ankle braces, special footwear insoles that help heal lower leg injuries and return to normal activities. 5. Toenail Fungus is a very common infection of the nails that affects millions of Americans. Some do not even suspect that they have toenail fungus until they develop dry, brittle and thick nails that crumble easily and might emit unpleasant odor. Your podiatrist will carefully examine a sample taken from your toenails to determine what type of fungal infection you have. After this a proper treatment is prescribed including topical ointments, foot rinses and even oral anti fungal medications in some cases. 6. 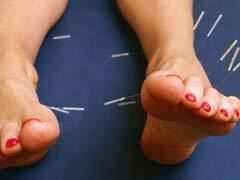 Ingrown nails might bring considerable foot pain and require immediate podiatrist’s assistance. A podiatrist might remove a portion or an entire toenail in severe cases to relieve this rather painful condition. It’s very important to treat ingrown nails seriously due to a high risk of developing nasty foot problems and infection that might spread to surrounding areas. 7. Bunions are deformities of the big toe resulting from improper footwear selection, wearing high heels and hereditary reasons. Patients with progressive bunions suffer from considerable pain, inability to walk for long periods of time and wear fashion shoes. Initially, podiatrists treat minor bunion with conservative methods, however, if the condition progresses, bunion surgery is recommended. The recovery time is rather lengthy and bunions have a tendency to grow back, sometimes years after the surgery. 8. Hammertoe is another condition of the feet that is caused by wearing shoes that are too tight and do not fit properly. Toe joints become deformed causing multiple foot problems and pain. Surgery and wearing orthopedic shoes are recommended to alleviate this condition. 9. Plantar warts are flat warts that appear usually on the bottoms of the feet and could be easily passed on to other family members. Plantar warts could appear if you frequently walk barefoot around pools, locker rooms or public showers. Podiatrists successfully treat these warts by freezing them with liquid nitrogen or using laser lights to evaporate these annoying foot problems. 10. Feet alignment support is accomplished by proper footwear selection and prescription orthotics that will help adjust your feet positioning. A qualified podiatrist can even help improve back aches that might have been bothering you for years due to flat feet, improper shoes or other foot conditions.